Infinite is the expansion of universe. But that 1 (one) pervades in all. The way digit 1 permeates in all. There is no number which does not contain 1. Like, when 1 joins 3 times the figures becomes 3 and 7 contains 7 ones. So multiply 1 with any digit, it keeps expanding, there is no concept of ‘nothingness’. When there is nothing there is no God. Divide it by any number it won’t be zero 0. So God permeates exactly like this. 1 is the best example to explain God. Guru Nanak our True Emperor blessed us by giving the most appropriate explanation of God by prefixing 1 before Om and then drew a line to show the expansion to make it omkar the expanded to make it perfect representation of God almighty: IK ONKAAR. 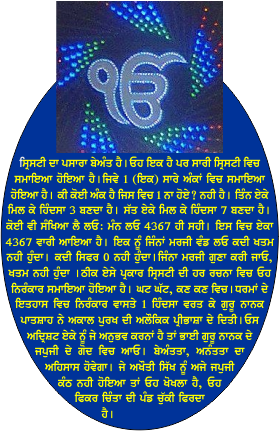 Do u want to feel that that invisible God then come to the lap of Guru Nanak’s Japuji. U will feel the expansion the infinity the endless One. U will know that the rest of universe is very much like u. Ur hatred will thus vanish. U will tend to love others. So men come. Come if u want to play the game of LOVE. Love to all.